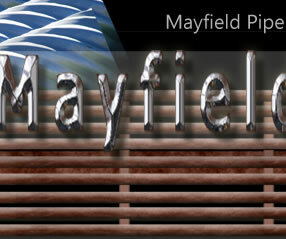 Mayfield Pipe and Cattle Guards is committed to satisfying your oilfield, agriculture, wildlife management, and commercial or residential projects or drainage needs. 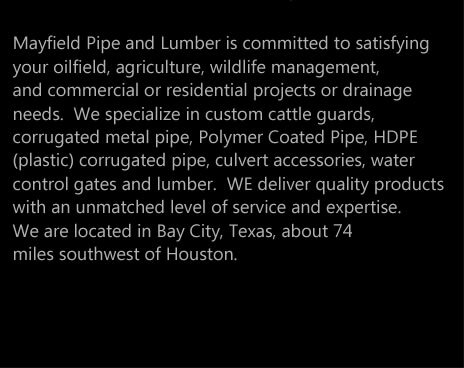 We specialize in custom cattle guards, cattle guard accessories, corrugated metal pipe, polymer coated pipe, HDPE (plastic) corrugated pipe, culvert accessories, and water control gates. We deliver quality products with an unmatched level of service and expertise. 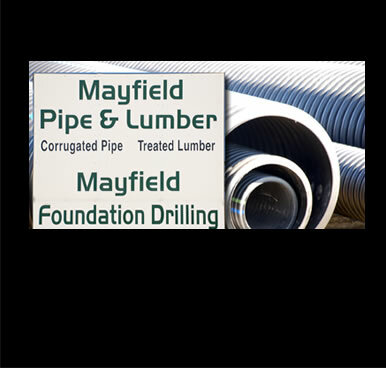 Mayfield Pipe and Lumber of Bay City, Texas is committed to satisfying your oilfield, agriculture, wildlife management, and commercial or residential irrigation and drainage needs. 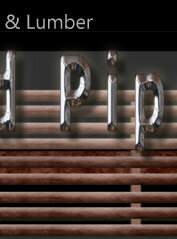 We specialize in custom rail on rail and pipe on rail cattle guards, galvanized corrugated metal pipe and polymer coated corrugated metal pipe, HDPE corrugated pipe, Tank Car Culverts, culvert accessories such as standard ends and safety sloped end sections, water control gates, and treated and untreated lumber. 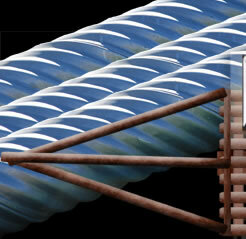 We also provide pipe accessories and cattle guard accessories to complete your jobsite requirements. Delivery is available to your jobsite, as well as installation.